Make a statement in your living room with a three piece occasional table set that's sure to take center stage. This versatile accent table group includes a rectangular coffee table and two matching square end tables that make a stylish addition to casual or contemporary decor. A sophisticated dark taupe reclaimed wood look finish wraps the tables, which feature lower shelves that offer additional space for storage or display. The ample surface area provides a sturdy foundation for lamps, potted plants and decor. Table Set - 3-Piece Set / Dark Taupe Make a statement in your living room with a three piece occasional table set that's sure to take center stage. 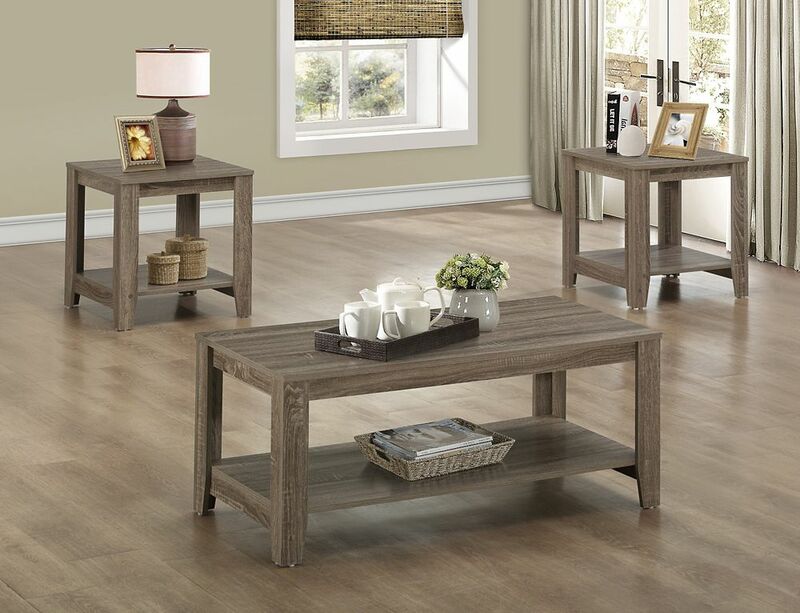 This versatile accent table group includes a rectangular coffee table and two matching square end tables that make a stylish addition to casual or contemporary decor. A sophisticated dark taupe reclaimed wood look finish wraps the tables, which feature lower shelves that offer additional space for storage or display. The ample surface area provides a sturdy foundation for lamps, potted plants and decor. Table Set - 3pcs Set / Dark Taupe is rated 5.0 out of 5 by 1.